SIG SAUER, Inc. is pleased to announce the Webb County Sheriff’s Office has selected the P320 Pistol as their official duty sidearm. The Webb County Sheriff is responsible for patrol duties, the county jail, and security of the courts. Additionally, the Sheriff’s Office operates an aviation unit and mental health unit. Webb County is the sixth largest county in the state, located in South Texas and includes the border community of Laredo, Texas. The P320 pistol is a modular, striker-fired pistol available in full-size, carry, compact, and subcompact sizing. The serialized trigger group makes the P320 adaptable to multiple caliber, size, and grip options. The P320 is available in 9mm, .357SIG, 40S&W, and .45ACP, with a choice of contrast, or SIGLITE Night Sights. The intuitive 3-point takedown requires no trigger pull for disassembly, and safety features include a striker safety, disconnect safety, and optional manual safety. 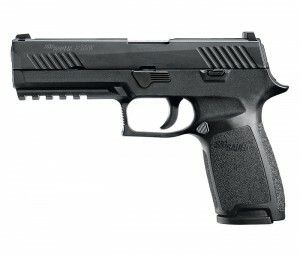 The Webb County Sheriff’s Office has acquired over 300 9mm P320 pistols and is currently placing them into service.